There’s no need for dull hedges in your garden – this superb collection of three of our favourites varieties will provide true year-round interest that will keep gardens alive all year-long. These tried and tested garden winners are perfect for separating and dividing areas in your garden, or for creating privacy in exposed areas, but they’re also perfect for fillings in any gaps your might have in existing beds and borders, or even build a new one from scratch. Once planted they will rapidly grow away and look tremendous from this year onwards, providing a stunning visual display and a degree of privacy and security for you, as well as a natural safe haven for a wide variety of wildlife. In a mixture of colour, from the red-tinged leaves of the Photinia ‘Red Robin’ to the beautiful creamy variegation of the Griselinia, this mix of hardy shrubs are guaranteed to brighten up beds, borders or even large patio containers if you’re short for space – wherever you fancy planting them! Plant together for a vibrant, year-round mix of colour, or plant separately and frame beds, borders and patios. These hardy shrubs will bring your winter-worn garden back to life in an instant, from early spring and they will not lose their colour or their leaves over the winter. Plant them right now – they’ll burst into life in spring and give you spectacular results this year and for many years to come! 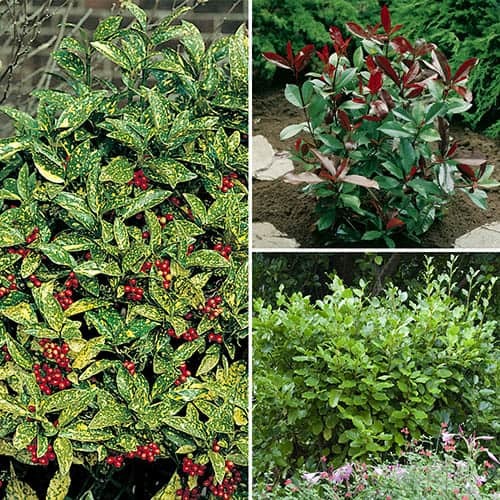 Supplied as a collection of 3 x 2L potted plants, one of each of the following varieties; Photinia Red Robin, Griselinia littoralis Variegata and Aucuba japonica ‘Crotonifolia’.